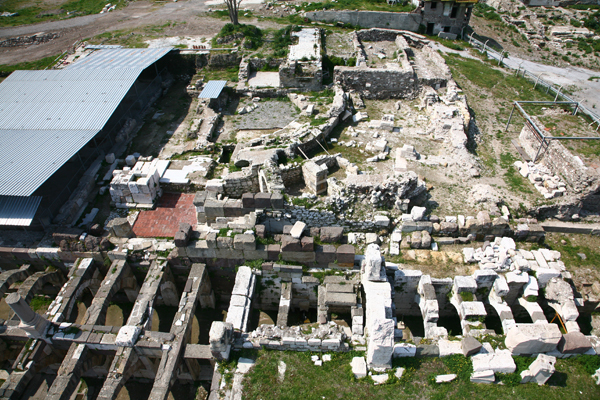 The agora (marketplace) sits at the centre of the ancient city of Smryna and excavations here are ongoing. Recent work has not only revealed more of the extent of the structure but also some extensive and enigmatic water tunnels under the basilica. A particular delight has been the discovery of graffiti in the basement levels of the agora’s northern façade. These drawings and writings are among the richest collection in the Greek speaking world – many of them inevitably rather bawdy, as is often the case with good graffiti! 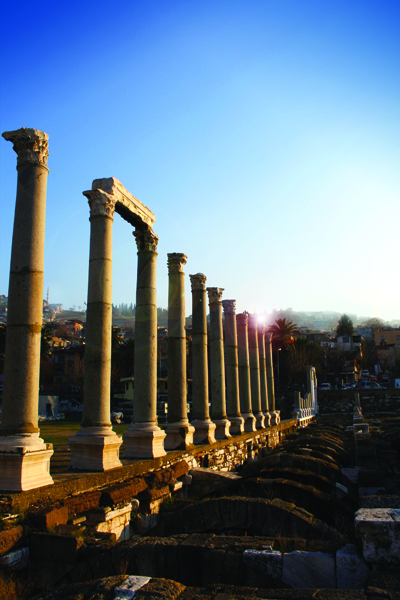 Excavations in the agora show that construction work began in the 3rd century BC when Alexander the Great’s successors moved the city down from its old hilltop position to its current position between the citadel and the sea. The new site quickly became an important port city. Details of this early building are uncertain, but the courtyard was levelled and on the north and west, stoas were built, each with two stories. Expansion came in the Roman period when the west stoa was rebuilt as a three story building and the north stoa as a basilica. Since it was cut into sloping ground, there were four galleries at the back and three galleries facing on to the courtyard. Both buildings were greatly affected by a massive earthquake in AD 178 which flattened much of the city; and both were rebuilt on the original lines – though this time with great arches added to the basement levels, possibly to reinforce the structures. The emperor Marcus Aurelius and his wife Faustina helped finance the rebuilding, and a monumental gate with two arches was erected in the west stoa in their honour, and portraits of them both were set in the west stoa. The façade looking onto the courtyard was used to watch the social, commercial, and political events, while the windows on the northern side would have provided a fine view of the northern part of the city and the port. Recently, however, we have been able to excavate the basement where rubble resulting from the 2nd century AD earthquake had been left in situ. It may be that it was deliberately left there to help support the structure above in the event of another quake. In effect, it has created a time capsule for the thousands of examples of graffiti found on the bays and columns that now have been revealed as we cleared away some of this detritus. However the most remarkable recent discoveries were two new buildings excavated on the west side of the agora. One of these is the Bouleuterion, the city council, where excavations are still ongoing. The building has a circular seating area, with a half-vaulted gallery, and 11 radial vaulted areas underneath. These radial spaces were used not only to support the seating area but also as a storage area. Reconstruction work on the building shows that it could house 450 members of the council at a time. Adjacent to it is another large building with a mosaic floor decorated in a geometric design, so we have named it the Mosaic Hall. While there is not enough evidence for the function of the building, we assume that it was used for social and political gatherings. Was it perhaps here that the members of the council met on business days and conducted, privately, the real business of the council? A third building uncovered in the west area is a Roman bath. Aelius Aristides, who lived in Smyrna in the 2nd century AD, talks about the many baths in the town, each being more beautiful than the other, so that one cannot decide which one to go to; this has to be one of these baths. Excavation is still ongoing, and so far part of the caldarium has been uncovered. This bath, standing between the agora and the harbour would surely have been the first stop for sailors coming into town.